The great thing about living in San Francisco is that with our mild climate, we can eat just about anything year-round. Take this beef stew for instance: such a hearty meal that is best enjoyed piping hot would not be an ideal dish to eat on a hot summer’s night in Chicago. Luckily for me, blistering hot days and uncomfortably humid nights are not a predicament of my agreeably temperate City by the Bay. Which means, copious amounts of ice-cream in the dead of winter and generous helpings of steaming hot savory stews in the summer! YAY! 1. In a large bowl, combine the flour, 1 teaspoon salt, and 1 teaspoon pepper. Dredge the beef cubes in the flour, evenly covering all the meat. Shake off the excess flour. Heat 2-3 tablespoons of olive oil in a large heavy pot over a high heat and brown the beef on all sides. Work in batches, overcrowding the pot will cause the meat to steam instead of brown. Add more oil as needed while browning the beef. Remove from pot and set aside. 2. Add another 2-3 tablespoons of olive oil to the large pot, reduce heat to medium, then add the onions, carrots, and potatoes. Cook, stirring occasionally, until the onions have just turned translucent (about 10 minutes). Add the garlic and cook until fragrant (about 2 minutes). Remove vegetables from pan and set aside. 3. De-glaze the pot: add 2 cups of broth to the pot and cook over a high heat, scraping the bottom with a wooden spoon to release all the brown bits. Add the rest of the broth and stir in the rosemary, worcestershire sauce, 2 teaspoons salt, and 2 teaspoons pepper. 4. Return all the browned beef and vegetables to the large pot. Bring to a simmer over medium heat, then reduce heat and cover. Simmer over a low heat for 2 hours, stirring every 30 minutes, until the meat and vegetables are tender. Stir in the frozen peas before serving. 1. Marinate the beef overnight in a red wine mixture: Combine 1 bottle of red wine, 3 smashed garlic cloves, 2 bay leaves, and 1 star of anise with the beef in a large bowl. Refrigerate overnight. 2. Reserve 2 cups of the marinade and substitute it for the 2 cups of broth when de-glazing the pot in step 3 of the recipe. * If using a dutch oven, this recipe can be cooked in the oven. Instead of simmering on the stove, place the covered pot into a 275F oven and bake for the 2 hours. * Chuck beef is a fattier cut of the cow. The fat breaks down during the long and slow cooking process, which tenderizes the meat. 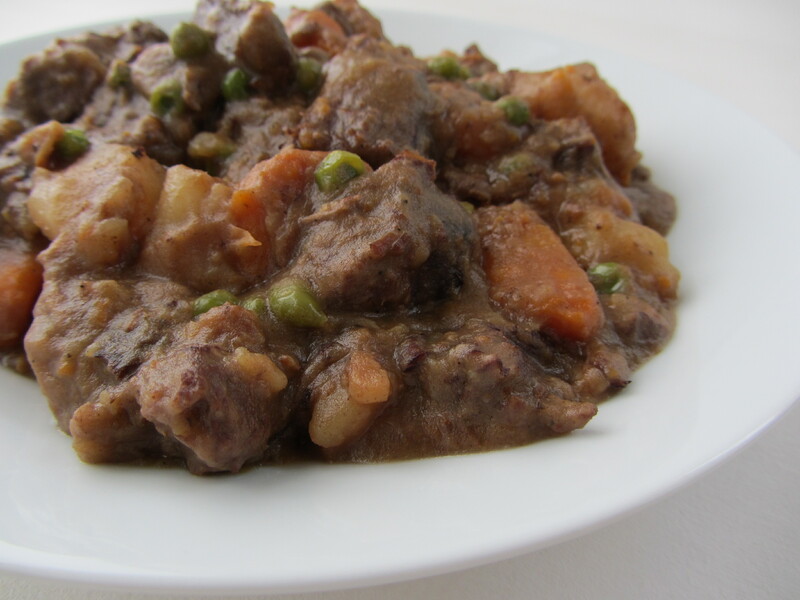 Using a leaner cut will not work; the end result will be a dry and overcooked stew meat.